The Institut de Planétologie et d’Astrophysique de Grenoble (IPAG) in Univ. 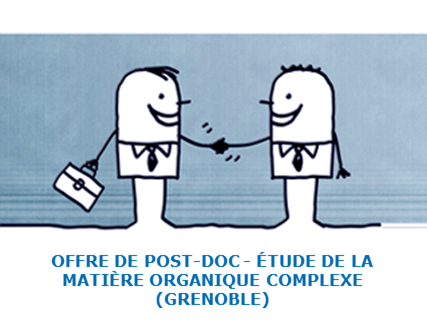 Grenoble Alpes, France invites applications for a postdoctoral research position in Laboratory Astrophysics. The appointment is initially for one year and may be extended to two more years, is funded by the French Scientific Research Center (CNRS) and is paid according to the French public service scale. 15 k€/year will be allocated to the successful candidate to carry his/her research project. IPAG is located in Grenoble (France), a lively and scenic university town. The postdoc will carry out original research related to the formation and evolution of complex organic matter in the solar system (and beyond) through the analysis by very high-resolution mass spectrometry of laboratory analogues and/or extraterrestrial samples. 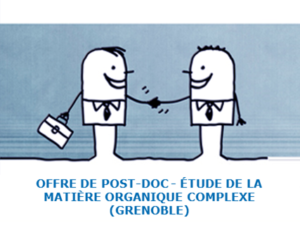 The postdoc will be joining the mass spectrometry group of the “planeto” team (∼20 faculties, technicians, postdocs and students) and will closely work with Dr. Véronique Vuitton (PI of the research project) and with other colleagues at IPAG (F.-R. Orthous-Daunay, L. Bonal, E. Quirico), as well as in the Paris area and the United States. The mass spectrometry group has a solid experience in Titan’s atmospheric chemistry as well as in the evolution of the organic matter present in small bodies (comets, meteorites) and is currently expanding its interests to Pluto and extrasolar planets. It has also significantly contributed to several space missions (e.g. Cassini-Huygens and Rosetta). Applicants must hold a Ph.D. with a solid background in analytical chemistry and/or laboratory astrophysics and have strong interest in planetary sciences and/or geochemistry and/or astrobiology. Experience in mass spectrometry and/or liquid chromatography and/or scientific programming is an asset. Applicants should send a curriculum vitae, a list of publications, a summary of previous research (2 pages max. ), research interests (1 page max. ), and the names of at least two persons who can be contacted for letters of references. Applications can be sent in electronic form or regular post (documents will not be returned) to the address below by April 15, 2018. Applications will be considered until the position is filled. The preferred starting date is June 1, 2018.